The VW Crafter is the best of the big electric vans so far, which is not a surprise in many ways as the standard version of this model is one of the very best in a competitive sector. VW designed the Crafter to be able to fit in with a range of different engine types, so the battery, motor and electric workings fit in seamlessly. The sheer size of the van means that limitations remain – it will never offer the range or payload of a diesel – but it offers an excellent solution for urban companies. Interested in buying a Volkswagen Crafter? The cargo space of the VW e-Crafter is excellent in itself, as it is unchanged from the diesel model. Because VW designed this van to be electric right from the start, it was able to integrate the batteries under the loading bay, which means they don’t take away any of the space. 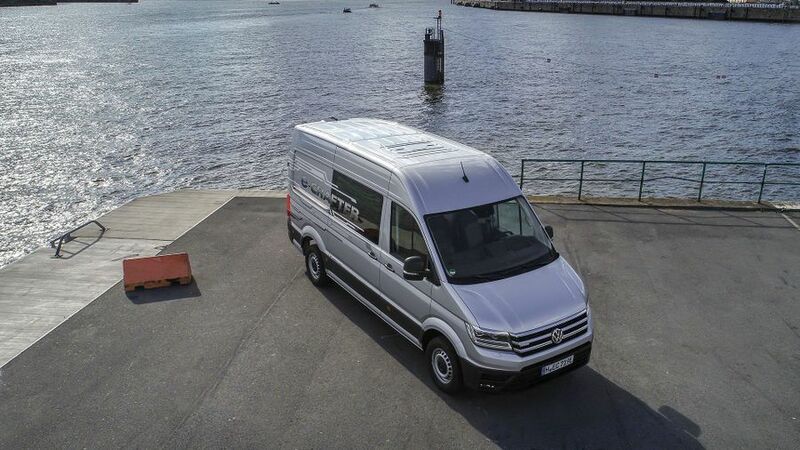 There is only the one size on offer: the medium wheelbase, high roof model with a max load volume of 10.7 cubic metres that is the most popular model in the Crafter range. Confusingly, VW says there is a choice of two payloads, either 0.975 or 1.72 tonnes. This is because there is a choice of either 3.5-tonne or 4.35-tonne gross vehicle weight (GVW) versions. There will be no tangible difference between the two, and it could just be a case of putting the van through a different test and sending it off to its new owner with a different GVW on the plate. The standard Crafter’s cabin is excellent, so it is reassuring the e-Crafter is unchanged in all but the tiniest details. The standard-fit automatic gear lever and the electric and charging information on the instrument panel are the most obvious ones. 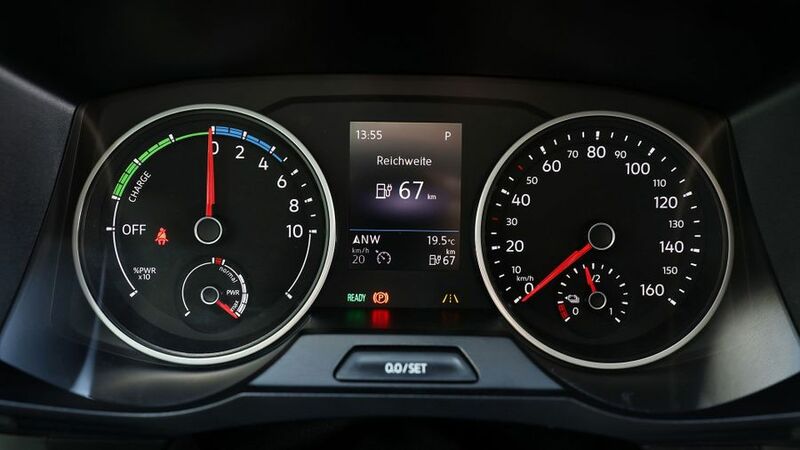 The central touch-screen also offers information on battery usage, but if that isn’t wanted, you can just set it off to act as a standard satellite navigation. If you ignore the purchase price, an electric van will always be an enticing prospect on a pence-per-mile basis. If you can get onto the right electric tariff, it need not cost much to charge the battery up at the end of the day, and mid-day top ups should be speedy, too. The ability to regain 80% of the battery’s charge in 45 minutes from a 40kW charging point will allow many to top up in a driver’s break. The range is officially 107 miles, but once you factor in the impact of the weather and the load, it should manage around 60 miles in real world use. 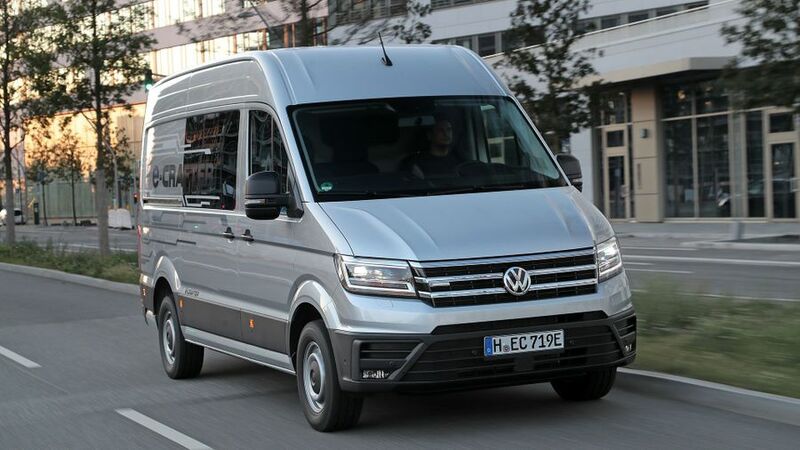 This might not sound like much, but VW reckons it is definitely achievable and should be more than enough for the urban couriers it is aiming the Crafter at. The simple approach means there is no Eco mode, so drivers will have to rely on their own right foot and the regenerative braking to maintain the battery level as best as possible. While an electric van is a new area for VW, the company has experience in the EV sector. The battery, motor and associated running gear under the e-Crafter is the same system as the one under the e-Golf hatchback. 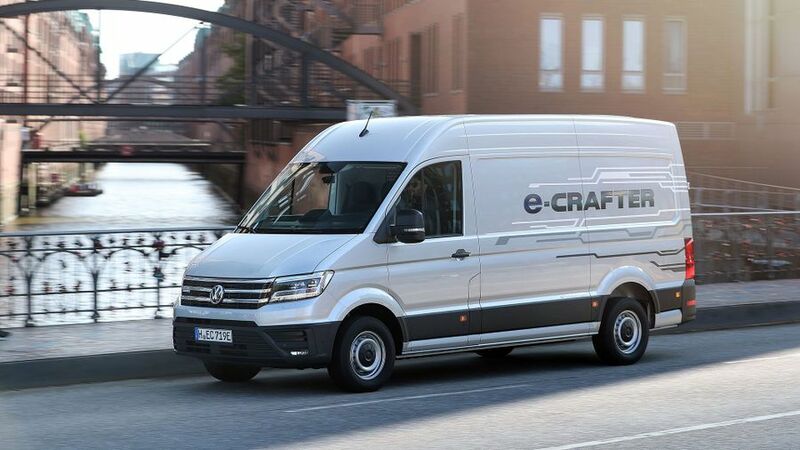 VW’s passenger cars score about average in reliability surveys, but the three-year unlimited mileage warranty on the Crafter should give some reassurance if it is matched on the e-Crafter. 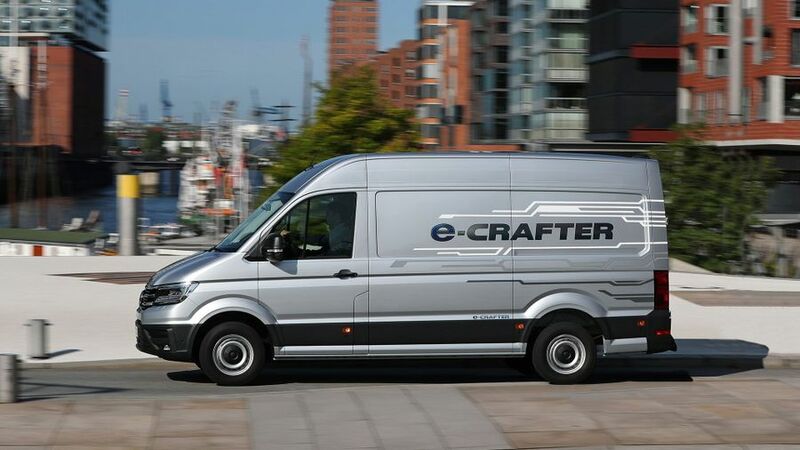 If there was any doubt about the urban-centric nature of the e-Crafter, it will be confirmed by the official top speed – it is limited to just 56mph. This does mean there is no 0-62mph time to illustrate the e-Crafter’s speed, but it is the initial burst of pace that is important for city drivers. There is a fantastic amount of instant power that means the e-Crafter is able to dart away from lights, even with a load on board. Getting going in the e-Crafter is simply a case of turning the key and driving off. With a one-speed automatic gearbox and no trickery, it is incredibly easy to leap in and get around town, even for those that have never been in an electric vehicle before. The batteries being under the floor doesn’t only benefit loading space, it also optimises the handling as it improves the centre of gravity and the weight distribution. 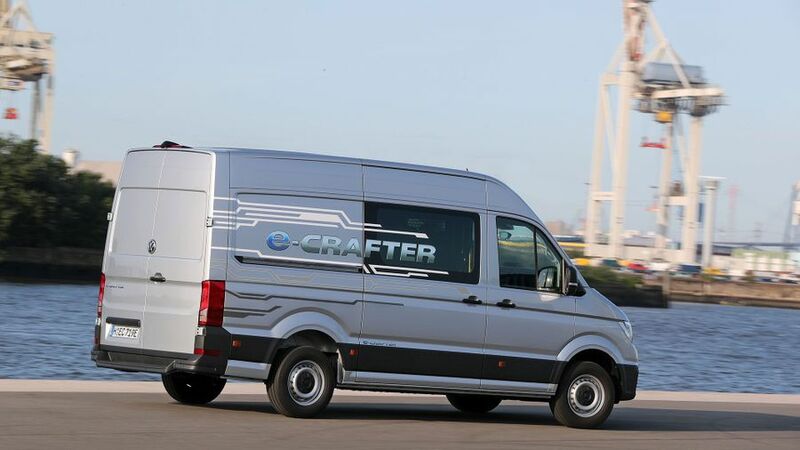 This means the e-Crafter is even more composed around corners than many conventional vans. The sharp steering means it is easy to thread around urban streets. The ride is excellent, too, with the suspension dealing well with speed bumps and potholes. VW has managed to carry over many of the good things about driving an electric car and put them into a commercial vehicle. The standard Crafter set a new benchmark for safety in its class when it was launched, and the electric version is set to be a high-spec model that will come with all the standard kit and more. As well as the autonomous emergency braking, post collision braking and cross-wind assist, the EV version will also come with a Park Pilot system that helps with getting into tight spaces. 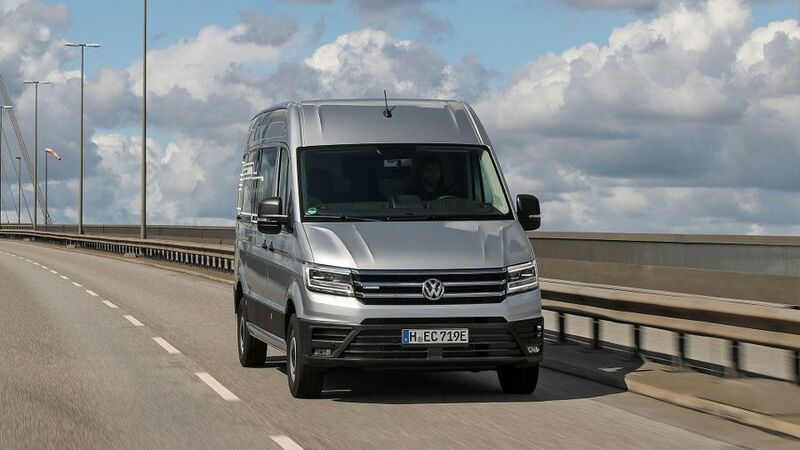 VW has yet to confirm the final pricing and spec for the e-Crafter, and with the right-hand drive model not due to come to the UK until 2020, it is likely to be a while until this is finalised. Because it is due to be a high-level trim, it should come well-equipped. As well as the Park Pilot, the left-hand drive models will come with LED headlights, automatic climate control, heated seat and windscreen, comfort seats, and satellite navigation all included. Only certain types of company will be considering an electric van, and if your daily mileage needs are not huge and you can charge back at base, choice is still limited. The VW e-Crafter stands out from the small crowd, though. VW has learned from its experience with the electric car market, taken the benefits, and applied them to the large van sector. Despite it going on sale in Europe in 2018, there is a while to wait until it comes to the UK in right-hand drive format – it won’t arrive until 2020. Those who want to go electric earlier, and are wedded to the idea of a VW, should be able to get the brand to sell them a left-hand drive model in 2019, though. As with anything, expect to pay a premium for being an early adopter, whichever side of the cabin the steering wheel sits.